“Geidai Collection” -- the art collection of Tokyo University of the Arts -- consists of various kinds of art such as antique art, paintings, sculptures, crafts, and architectures, but also archaeological materials, photographs, and music materials, etc. The core of our collection? now holding more than 30,000 works and objects? goes back to the year before the founding of the Tokyo Fine Art School (Tokyo Bijutsu Gakko, the predecessor of Tokyo University of the Arts). The founding members of Tokyo Fine Art School, such as Okakura Tenshin, have decided to collect the artworks as educational reference, and also documents and material which are closely related to Tokyo Bijutsu Gakko as one of the important missions of the school. Therefore, this school holds antique and modern artworks of good quality, and students can use them for their study. Tokyo Fine Art School also kept collecting the artworks of students as an outcome of the education, from the beginning until now. Geidai collection is also characterized as the documentation of Japanese modern art history and art education, from the perspective of Tokyo Bijutsu Gakko / Geidai. This exhibition will introduce our collection in various ways. We will present not only the works known as masterpieces but also the works and documents which have not been exhibited often to the public, exhibiting them from a new point of view. We feature a special section “Mount Fuji in the Twelve Months by Ike no Taiga” (1st period). This was originally made in a series of 12 works but the one depicting September was missing, Last year this scroll was found and added to our collection. To commemorate this occasion we will present all of the 12 scroll paintings. Other section “Drawings from Kiriu Kosho Kaisha” (2nd period) features the set of drawings from Kiriu Kosho Kaisha, the First Japanese Manufacturing and Trading Company, which is quite important in the history of modern craft history but rarely shown. We will exhibit these documents, based on the recent research. 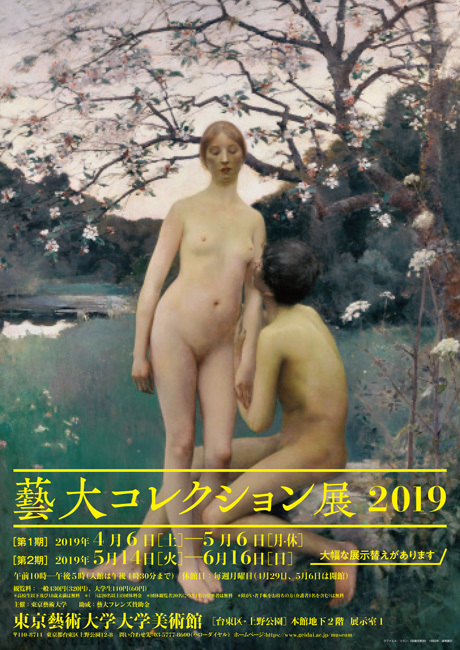 We will present two exhibits “The Japanese Artists who studied in England” (all period) and “The landscapes by the Japanese-style painting division of Tokyo Fine Art School” (2nd period) as a result of our academic research. Both themes were rarely studied but deserve attention. As for the former, we often focus on the Japanese modern art in the French influence context, but we will focus on the works by the artists who studied in England and evaluate the British elements in these works. As for the latter, we will compare the depiction of the landscapes by the professors and students of the Japanese-style paintings division, and focus on their relationship with the contemporary art society. Researching their own collection is a fundamental activity as a museum. We hope this exhibition will be an opportunity to enjoy the various aspects of the Geidai Collection.